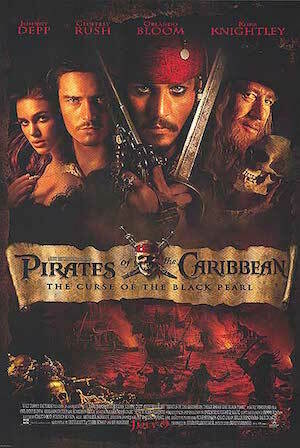 Pirates of the Caribbean: The Curse of the Black Pearl set in motion one of the biggest movie franchises in the history of Hollywood. In the swashbuckling tale, Johnny Depp and Orlando Bloom lead a cast of buccaneers, soldiers, and civilians on a quest against a dreaded curse. Under the leadership of first mate Hector Barbossa, Captain Jack Sparrow’s ship – The Black Pearl – was seized. Along with their mutiny, the crew of misfits then stole cursed gold and consequently were cursed themselves. The key to lifting the curse lies with the son of one of the former mutineers, William Turner (played by Orlando Bloom). Let me take you back to one of the most important parts of the movie. Captain Barbossa has kidnapped Elizabeth Swan and is now taking her to the pirates’ secret island. However, Barbossa, along with the rest of his cursed crew, are unaware that Jack and Will have followed them into the lair. Once inside, we’re told about the curse that the pirates are under. They’ve suffered a long time for stealing the cursed gold, but now they think forcing Elizabeth to make a sacrifice of her blood will lift the curse. Unfortunately for the pirates, Elizabeth isn’t who they think she is, and so the curse isn’t lifted. In the midst of a disagreement amongst the pirates, Will helps Elizabeth escape with the gold medallion. Basically, the pirates were under a curse they couldn’t lift. They thought they could un-shackle themselves from the curse by sacrificing some of Elizabeth’s blood, but eventually they found out that Elizabeth had the “wrong blood.” She wasn’t the sacrifice the pirates needed. As a consequence, the pirates remained under their curse. Here’s where this impacts us: you and I are also under a curse, the curse of sin and death. And for us, it’s a curse that we cannot lift through a sacrifice of our own. Someone else has to lift it for us. That “Someone” is Jesus Christ. He is the only One who has the “right blood” to lift the curse of sin and death from us. How eager were the pirates to have their curse lifted? How do you know? Why didn’t the pirates’ plan work? What was wrong with their sacrifice of Elizabeth’s blood? Enough on “make-believe” pirate stories for a moment. We’re all under a very real curse in this life. Do you know what it is and the punishment it carries with it? Why does Paul call the Galatian church people “fools”? According to verses 10, why were they (and are we) under a curse? In the movie, the pirates went about lifting the curse in the wrong way and failed. How does Paul say that you and I try to lift the curse in the wrong way and fail? Why is it that Jesus is the only One who can lift the curse of sin and death from us? Do you know if you’ve been set free of the curse of sin and death? Why or why not? The point I want you to walk away with is a crucial one: we’re all under the curse of sin, and the only sacrifice that will lift it is the blood of Jesus Christ. That’s why we read the passage from Galatians. Those folks knew they were under a curse…but they had a very “foolish” way of dealing with their situation. Instead of lifting their curse they only made it worse. The Apostle Paul made it clear in Galatians 3 that it is ONLY Jesus that can set us free of our curse of sin and death. You and I need to ask Jesus to forgive us of our sins, and commit to following Him. That’s the ONLY way to be set free from the curse. In this passage, Paul makes it clear that Jesus is the ONLY ONE with the “right blood” for lifting the curse of sin and death from us. If you don’t know the story of how that happened, let me explain it to you quickly. The Bible teaches that Jesus, God’s one and only perfect Son, left Heaven to come to Earth to die on the cross for our sins. Now, remember back to the passage from Galatians for a second. Paul said that Jesus became a curse FOR US to remove the curse FROM US. Jesus did that when He died on the cross. His blood was literally shed for us because He loves us. That same blood is the blood that Paul talks about here in Romans 3 that I just read to you now. So, let me lovingly warn you. All of us were born under a curse; there’s no arguing that fact. If you want evidence of that, just look at your lifestyle. No matter how good you try to be, you still lie, cheat, cross boundaries, hurt others, and so on. That’s sin. That comes from the curse. But let me continue. You cannot lift the curse you are under. Only Jesus can do that because of His perfect blood. If you try to lift the curse yourselves, you will look just as foolish as those pirates who chose to sacrifice the wrong blood. So, here’s my question for you: If you haven’t asked Jesus to remove the curse of sin and death from you, why not? He offers this grace to anyone who believes in Him… all you have to do is ask… it’s the most important prayer you’ll ever pray.